Life in Balance is a monthly green newspaper which describes itself as ‘your monthly green solution to natural & eco-friendly living’. I believe one can choose to receive the newspaper by email and save some paper. The first edition was not very large, about 15 pages, but contained some interesting articles. The articles themselves are generally quite short and cover a diverse range of topics eg. news & innovations, design and living, travel, food & wine, etc. Simply Green touts itself as a green lifestyle magazine. The articles covered a variety of topics and I found them to be informative and not too complicated. I think that readers who are just getting into the green thing will appreciate the straight forward information on the various green topics (even I learned quite a bit). Example articles in the first edition are: Seeing the light – how energy efficient lighting helps the environment, Corporate greening – the Pick ‘n Pay story, Greening the nursery – keeping baby eco happy, etc. There are also regular sections including green news, kitchen, drink, style and tech. Shared Earth puports to offer ‘practical ideas for self sufficiency and sustainable living’ and it is definitely a lot more practical than Simply Green. While Simply Green is informative, Shared Earth gives practical advice, from drying foods at home and baking bread to flowerpot farming and making your own sun stove. Shared Earth will be enjoyed by those who are keen to get their hands dirty (quite literally) and put into action all they have learnt about living sustainably. Each of these publications fills a different niche and they do not invade the territory of the two other green magazines which have been around for a while. 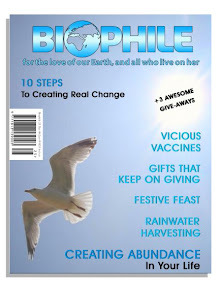 Biophile has been around for many years, in fact this is their 4th birthday issue. I enjoy reading Biophile, they really open my eyes to see the other side of the story. While some of the articles are a bit too ‘spiritual’ or conspiracy theorist for me, I never fail to come away with some new found knowledge. Their website has a lot of back articles available for you to read, I could spend hours on the site reading up on my favourite topics. MindShift is my favourite green magazine, it’s ‘a magazine for people who can change the world’. It’s more corporate oriented and looks at the important role corporations play in moving to a sustainable and ethical way of living and doing business. The editor, Monica Graaff, recently won an award for environmental journalist of the year. That does not surprise me because MindShift is a top class publication with well written, interesting and relevant articles. These magazines together cover the broad spectrum of green interest. At least one of these magazines will be of interest to you, maybe more. I could easily read all of them but spending over R100 on magazines every month seems a little irresponsible, so I will have to choose.